This week’s I heart faces challenge is “vroom vroom” and so I immediately thought about this photo I took a few weeks ago at our Neighborhood Association block party/meeting. The police dropped by to fill us in on the happenings in the neighborhood and let the boys take turns sitting in the police car. 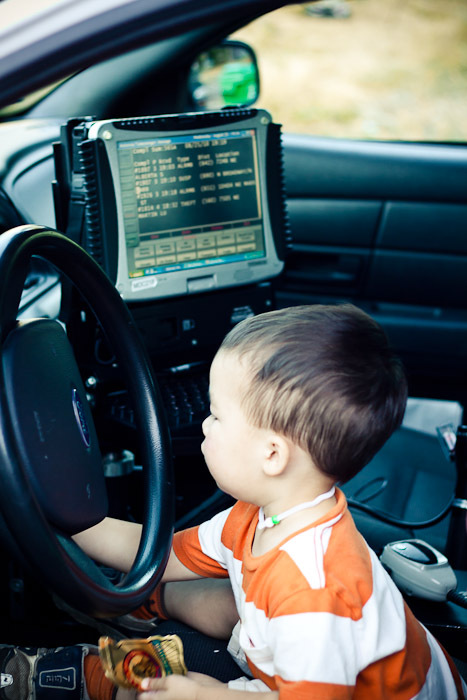 He stopped short of putting on the siren, but allowed them to push a few buttons and hold the steering wheel. It was very exciting moment for them (ok, and I may have been a little interested as well). Here’s an unsolicited tip – don’t go to a neighborhood association meeting unless you want to know all about every single crime that could potentially affect you or your home – especially when you live in an urban area like we do. Now, for better or for worse, I know about every burglary, shooting and petty crime in the neighborhood and have been obsessively checjking the locks on all our doors and windows. Sometimes too much information is not necessarily a good thing. This entry was posted in Children, Life, Photography, Samuel, Thomas. Bookmark the permalink. Little boys push EVERY button in EVERY type of vehicle! So cute!